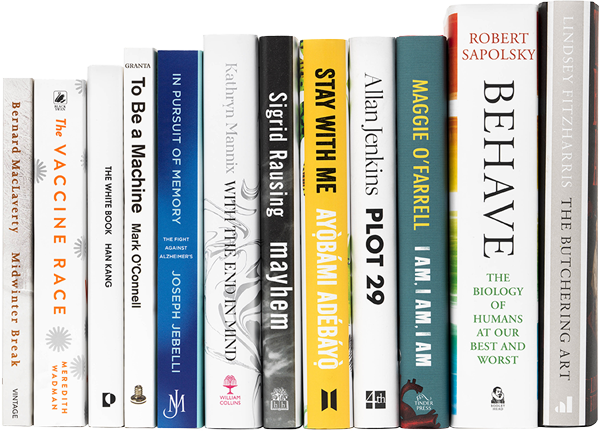 The 2018 Wellcome Book Prize longlist has been announced, celebrating the many ways in which literature can illuminate the breadth and depth of our relationship with health, medicine and illness. The longlist of twelve titles was selected by a judging panel chaired by artist and writer Edmund de Waal OBE with Dr Hannah Critchlow, Bryony Gordon, Sumit Paul-Choudhury and Sophie Ratcliffe. With the End in Mind: Dying, death and wisdom in an age of denial (William Collins, HarperCollins UK) by Kathryn Mannix (UK) Non-fiction. Read our exclusive extract. This year’s longlist features three poignant novels about the different stages of love, life, birth and death. These cover the grief of losing a newborn sister through a stunning contemplation of the colour white (The White Book), the deterioration of a relationship, seen through the eyes of an ageing alcoholic (Midwinter Break), and fertility, family and sickle-cell anaemia (Stay With Me). The three memoirs in contention offer a powerful insight into the impact of addiction on a family (Mayhem), the long-lasting effects of trauma and the therapeutic benefits of gardening (Plot 29) and one individual’s near-death experiences in a tenaciously powerful account of what it means to be alive (I Am, I Am, I Am). Death and mortality are also explored through a touching and unparalleled look into the life of palliative care workers (With the End in Mind) and a very human story about the race against the clock to find a cure for Alzheimer’s disease (In Pursuit of Memory). From the science of our cells to the science of our minds, the longlist reveals the epic and controversial story of the creation of some of the world’s most important vaccines (The Vaccine Race) and an eye-opening exploration of the science of human behaviour (Behave). Looking to both the history and the future of medical science, the list includes the story of Joseph Lister’s transformation of Victorian surgery (The Butchering Art) and a cutting-edge tour of transhumanism and radical life extension (To Be a Machine). Five debut books appear on this year’s longlist: Stay With Me by Ayọ̀bámi Adébáyọ̀, The Butchering Art by Dr Lindsey Fitzharris, In Pursuit of Memory by Joseph Jebelli, To Be a Machine by Mark O’Connell and With the End in Mind by Kathryn Mannix. The shortlist for the prize will be announced on Tuesday 20 March, with the winner revealed at an evening ceremony on Monday 30 April at Wellcome Collection. We hope to run some extracts / Q+As in due course. See also our coverage from previous years.